For those using Bluejeans for web training, your Docebo learning platform can integrate with this videoconferencing platform, so your users can access live training sessions directly in webinar courses in their Docebo platforms. This integration is available for Docebo Enterprise plan and Growth plan clients. To begin the integration, log into your LMS as the Superadmin, then access the Admin Menu by scrolling your mouse over the gear icon in the top right corner of your platform. In the Admin Menu, select the Add New Apps button. Then, select the Web Conferencing tab. Find BlueJeans from the list of apps, then press the Activate App button in the app’s row. Read the description in the pop up box, then press Install Now. You can now find the app in your Admin Menu. Name: The name of the App (Example: “DoceboBlueJeans”). Description: The description of the integration. App Key: The app key that you create as preferred (Example: “Docebokey”). Once you’re finished, press Save. Now, on the Groups Settings page, your new app will appear in the apps list with the name, description, and app key that you created. Additionally, you will see the secret key. Then, enable the OAUTH ACCESS tab. You will copy all of this information into your Docebo learning platform to complete the integration. Now, you can begin configuring BlueJeans in your platform by accessing the Admin Menu, then pressing the Manage item in the BlueJeans section. On the BlueJeans settings page, press the New Account button to add your BlueJeans account in your platform. 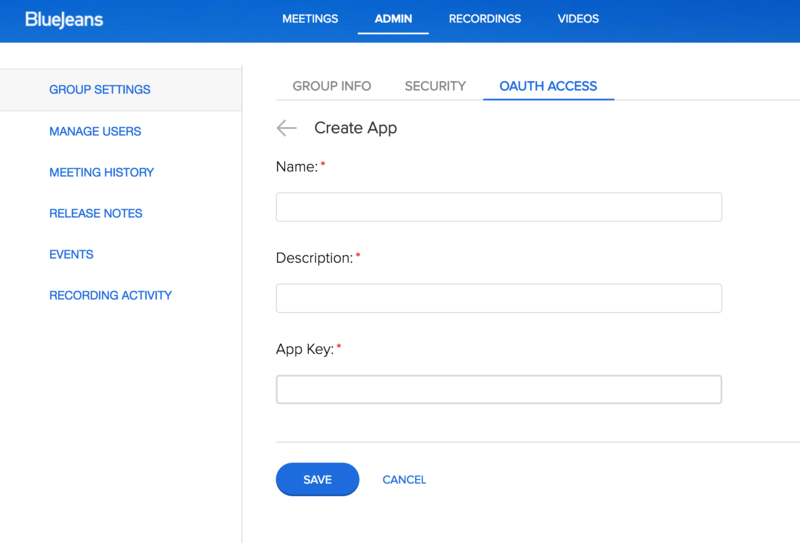 Then, in the pop up box, add your Account Name, App Key, App Secret, Webinar Tool Username, and Webinar Tool Password into the corresponding text boxes. The account name, app key, and app secret are the information you saw in the app’s row in the list of your apps in BlueJeans. If you need to retrieve this information again, you can do so by logging into your BlueJeans account and proceeding to this URL. The Webinar Tool Username and the Webinar Tool Password are your BlueJeans credentials that you enter to log into your BlueJeans account. You can add additional information as necessary. Finally, type in a quantity for the max number of sessions per course, max total number of sessions for this account, and max number of concurrent rooms. Please refer to the note above these text boxes: To allow an unlimited amount of sessions or meetings, enter “0” in the following fields.When finished, press Confirm. Now, your BlueJeans account has been integrated with your learning platform. Now you can use the Meet-me (BlueJeans) web conferencing tool for webinars. To learn how to set up a webinar session, refer to this article. To select Meet-me (BlueJeans) as the web conferencing tool, select the option from the Tools dropdown menu when creating a webinar course. Then, select the BlueJeans account that will be used for the webinar or meeting.